A meteorite is a body of space debris that enters the atmosphere of a planet and survives the friction with surrounding atmospheric gases to impact the surface energetically. Impact causes planetary cratering, ejecta and dust (forming a layer of regolith on planets with low geological activity such as Mars). This poses an obvious risk to a Martian settlement, and due to the tenuous atmosphere of Mars, smaller debris have the greater chance to impact the surface. Small meteoroids are best handled by a thick layer or regolith. Mars One plans to cover the inflatable greenhouses with at least 2 meters of it. Most meteoroids are small ones. Also, self-healing puncture protection for space suits and houses should be installed. Bigger meteoroids are not so frequent, but they can happen. Meteoroids of the size of a few centimeters are absolutely fatal. Nothings can be done to fend them off. The kinetic energy is way too much. And yet, there are possible precautions. One is to modularize the settlement with redundant facilities on different places. In the case of a hit, the affected module may be destroyed, but the remaining parts allow the surviving settlers to continue the colonization. For even bigger impacts the needed distances between the redundant modules must be larger. When the settlement reaches 20 persons, a second settlement may be built, dividing the colony in two parts, with a distance of a few hundred meters. Those two settlements should be equipped to work independently from each other, but cables and pipes between them help to support each other in emergency situations, e.g. to supply oxygen and electricity. A railroad between them allows material and person transport. Mars Global Surveyor images of the same site in 1999 and 2006 - Impact from meteorite is obvious. On January 9, 2006 the Mars Global Surveyor MOC science operations team came to the realization that their camera (used primarily to map the Martian surface) may be able to locate and characterize fresh impact craters on the surface of Mars. Such a survey would provide useful information about the current meteorite impact rate. This survey would be the first of its kind ever carried out on a Solar System body (including the Earth-Moon system) due to the unprecedented number of high resolution cameras inserted into Mars orbit. In results gathered on January 6, 2006, the MOC had acquired a new feature on the Martian surface in Arabia Terra in one of its images. The feature was circular and very dark. At the time, the camera was capturing images at a resolution of 240 meters/pixel, so there were some ambiguities as to what the blurred feature was. The team began exploring the possible scenarios, but after proving shadows of the two moons, Phobos and Deimos were not to blame, they quickly realized that something in the area was new when compared with images taken by Mariner 9 (in 1971) through to the Mars Express mission (in 2003). There was still the possibility that the dark circular object may have been caused by the removal of sand and dust due to high winds in the region so better observations had to be carried out. To increase the resolution in the images, a technique known as Roll-Only Targeted Observation (ROTO) was employed. This massively improved the images for analysis, the new resolution registered at 1.5 meters/pixel allowing the team to see the main impact crater and several smaller craters arcing away from the large dark spot. Another observational technique – compensated Pitch and Roll Observation (cPROTO) – was used to improve the images further until the evidence was indisputable. A fresh impact crater had been discovered. 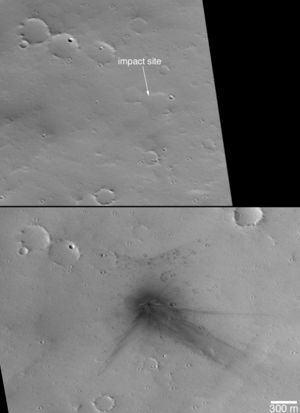 Mars Odyssey's THEMIS instrument and Mars Express' High Resolution Camera (HRSC) were able to provide supplementary observations of the area to constrain the impact date to some time between November 12, 2004 and January 6, 2006. Since this first discovery in January 6, 2006, another 20 new impact craters have been discovered by the MOC. 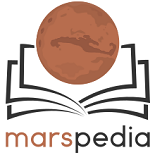 What is the size and frequency of meteorites on Mars? What is the probability for a human body to be hit by a meteorite on Mars in an hour? ↑ Go to: WayBackMachine. Enter: [http://www.astroengine.net/article.php?id_art=36]. Chose the 9th day of June 2007. This page was last edited on 17 December 2018, at 16:50.